Pets are part of the family, so you have to see these hilarious pregnancy announcements that include your cat. Usually, people think of making a pregnancy announcement with their dog, but all of your fuzzy furballs are about to have their world turned upside down by the baby. Include your kitties from the start, let your cat help you tell the world that baby is on the way. Need some ideas? Here are my top seven ideas for a pregnancy announcement that include your cat. Did you include your cat in your pregnancy announcement or know somebody who did? Did one of these pregnancy announcements that include your cat have you laughing? Tell me in the comments! Let’s face it, cats are simply not as agreeable as dogs when you are trying to snap a picture. Why not add a few quick props such as your pregnancy test and your pregnancy scan. Then later, you can edit your message in. Then you can get that perfect shot where the cats are looking at the camera, and the world can read your adorable message. We’re paws-itive this pregnancy announcement is magical! We have to hand it to you; you kept this pregnancy secret on the down low for a while. Now with your pregnancy announcement the cat is out of the bag and everyone knows! This announcement is even easier if your cats like bags as much as mine does. A bag is practically a present in itself for kitty! This adorable kitty does not seem super excited about this note, but I bet the parents to be are excited! I like that they included this photo in what appears to be the cats favorite window spot. Make sure to bribe with a can of tuna for that photo, too cute! 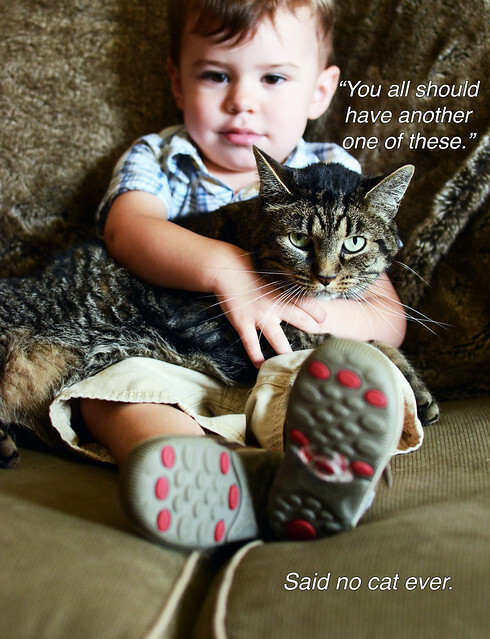 Here is another easy and hilarious idea for pregnancy announcements that include your cat! If you already had a crib from baby number one or are just already prepared for baby why not snap a picture of your kitty exploring the crib. At some point, that cat is going to jump in there anyways, and it makes an adorable and fun announcement before you shoo them away! Hahaha, what an adorable twist on a Prego pasta sauce announcement! I love the idea of pairing up your kitty next to a jar of sauce for a pregnancy announcement. Your friends and family are sure to be surprised! Having problems getting your cats to look at the camera? If you have art skills why not draw a sweet announcement. Most cats are known for not adapting quickly to change, so a new baby in the house might be an adjustment for a while. I love this announcement where this cat has no idea what is coming. This pregnancy announcement idea is too sweet. Have baby number two on the way? 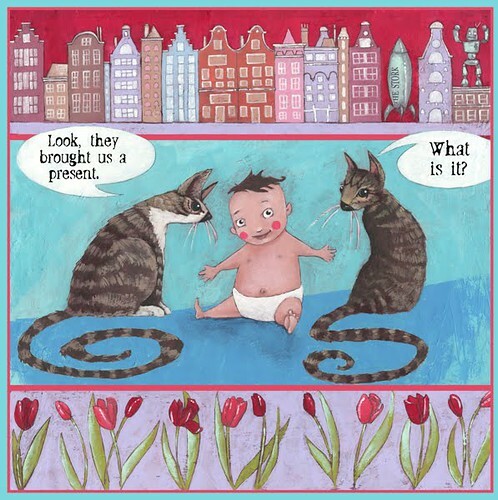 Share your cats elation at the idea of a second child to pull his tail love him. You can tell this cat is SUPER excited for baby two. Don’t worry, your family and friends will be excited for you! These are all so cute!!!! I was having a rough day until I saw this. What a cute way to include the fuzziest family member in the pregnancy announcement! People really love their cats! Very cute ideas for any cat lovers. You could even use a few of these for other pet owners. Love them. Very creative. Oh my gosh, these are too cute! I like the baby holding the cat! So creative! These are all so adorable. I love the idea of including the cat. What a fun way to recreate the traditional pregnancy announcement. These are all fantastic pregnancy announcements. I will have to share this with a friend that just found out she is pregnant. I love the “My parents are getting me a human” announcement. These are all great ideas. Oh how cute are these? All super cute and I love the idea of using cats photos in pregnancy announcements! Ha, ha, ha… I love that one that says our parents are getting us a human. That is so super-funny! These are all adorable. Thanks for the afternoon smiles. I love every single one of these ideas! They are so unique. These are such cute ideas for pregnancy announcements. I especially love the “getting me a human” one, that is funny. Stop!!! These are too cute. <3 Can't handle it! I'm sending these to my pregnant & cat-obsessed sister. She will probably be inspired to do the same! Finish Revolution Challenge: No more scrubbing and rinsing!